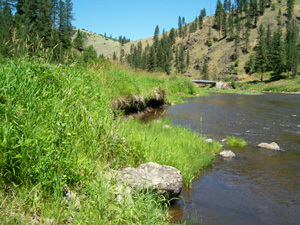 The South Fork Clearwater River (SF CWR) Riparian Restoration Project is designed under the guidance of the SF CWR Watershed Advisory Group (WAG) and the SF CWR Total Maximum Daily Load (TMDL), and represents activities identified in the SF CWR TMDL Implementation Plan. 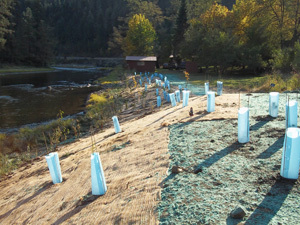 Riparian restoration included the re-sloping and stabilization of an estimated 600 feet of unstable bank and the re-vegetation of approximately 3,000 square feet of variable width buffer.Bank stabilization techniques included the excavation and re-sloping of the stream bank and the installation of wetland sod mats and erosion control fabric. 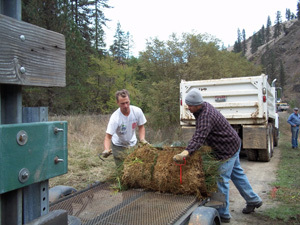 Native plants were planted to provide additional stabilization. Bank stabilization will reduce sediment loading within SF CWR and the re-growth of the riparian vegetation will provide shade, leading to a decrease in elevated summer water temperatures. This is a critical target area for sediment reduction and temperature due to the intensive impacts from agriculture, ranching and residential development in the watershed. The stream banks are steep and actively eroding. 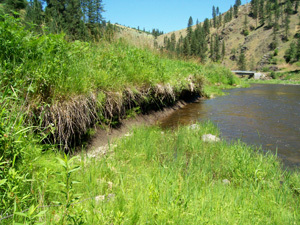 Limited woody vegetation exists on the banks and the addition of fill material on the banks have caused hydrologic changes in the flow which is also contributing to bank erosion. Why Restoration? 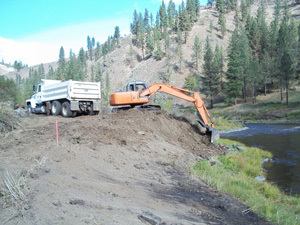 (Spring 2005): PCEI in cooperation with the Idaho Department of Environmental Quality and the local Watershed Advisory Group determined this was a priority project for non-point source sediment reduction due to its visibility to the community. Actively eroding stream banks caused by current and historic land use will be re-sloped and stabilized. Excavation of the Stream Banks (October 2010): 600 linear feet of stream bank was excavated during the low flows of 2010. 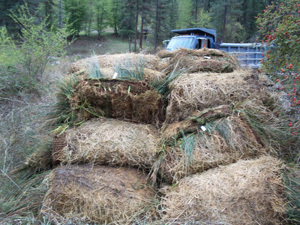 Wetland Sod Delivery (October 2010): North Fork Native Plants our of Driggs, Idaho delivered a truck load of wetland sod mats to be installed on the project site. Wetland Sod Moving (October 2010): Thirty-five wetland Sod mats were installed at the toe of the excavated stream bank to stabilize freshly excavated soil. Wetland sod mats are composed of native sedges that have already established a root system. Following installation of the wetland sod mats with stakes, the mats will root in and the coir fabric base will biodegrade. 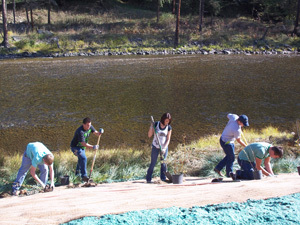 Fabric and Hydro-seed (October 2010): Hydro-seed was sprayed prior to the installation of the erosion control fabric. Hydro-seed mix consists of native grasses and wood fiber mulch. 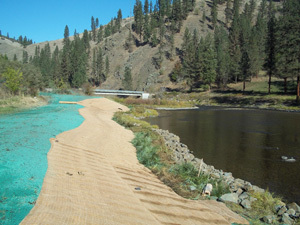 Erosion control fabric is biodegradable coconut fabric used to stabilize the freshly excavated stream banks. The grasses will grow through the fabric and within two growing seasons the fabric will no longer be visible. 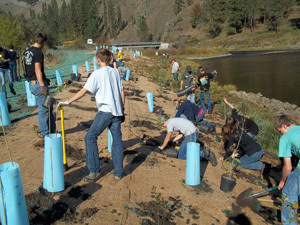 Grangeville High School Students Volunteer (October 2010): High school students from the local community spend the afternoon talking to the PCEI AmeriCorps members about restoration and planting 350 native trees and shrubs throughout the project site. Volunteers Learn about Restoration (October 2010): Volunteers from the Grangeville High School learn about the value of native trees and shrubs in restoration. After Restoration (October 2010): Site photos following excavation of the stream bank, installation of wetland sod, installation of the erosion control fabric and then finally the planting of 350 trees and shrubs.